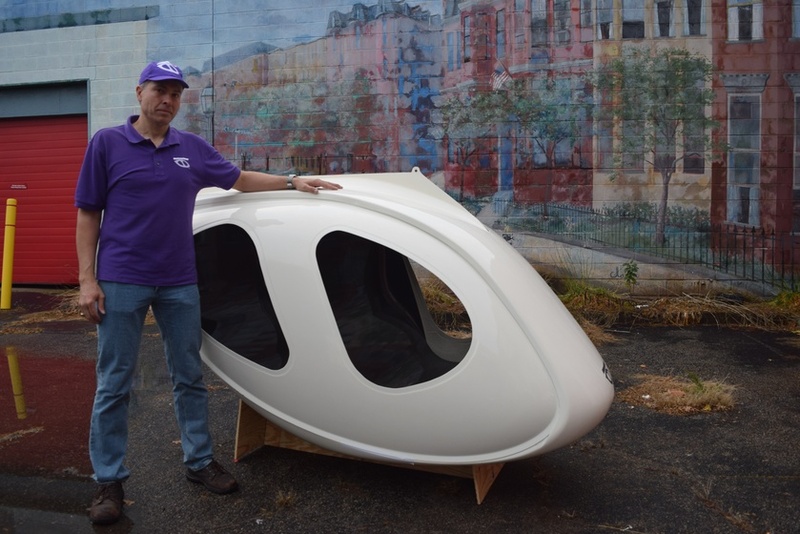 Vivekae M. Kim Mike D. Stanley, CEO of Transit X, shows off the pod he hopes will revolutionize public transit. On a cloudy November afternoon, I meet Mike D. Stanley at the unassuming CubeSmart Self Storage in Brighton. While the setting is more suited to college students boxing up their belongings, I’m here to take a seat in the pod of the future. Stanley is the CEO of Transit X, a Boston-based start-up that aims to someday replace almost all road vehicles — including cars — with public pod transit. It’s cold and I’m wearing a winter coat. Stanley, on the other hand, wears a short-sleeved, bright purple polo embroidered with Transit X’s logo, and a similarly branded purple baseball hat. He’s pulling an H-shaped wooden frame into the empty parking lot, but pauses to greet me. “You wanna do some wingnuts?” Stanley asks. I get to work, fumbling to tighten the wingnuts on the pod’s presentation stand. The two of us together lift the pod onto its wooden mount. After the pod is positioned, I approach it like I would a UFO, slowly extending my arm toward one of the windows. To my surprise, my hand sails through where I expected the window to be. Drumming my hands against the surface, the material feels plasticy and hollow. Stanley rips off the white duct tape holding the pod’s door shut, and I step inside, situating myself in the carpeted first row. The pod purportedly fits a “family of five,” but I can’t imagine anyone comfortably riding shotgun. Its sloped interior prevents me from stretching my legs fully. Eventually, the wall space will be a “personal IMAX theater,” Stanley tells me. As I sit, immobile, in this “flying solar pod” model, I realize the pod feels like what it is: a first prototype. When I met him a day earlier at the Smith Campus Center, Stanley was immediately identifiable, repping yet another purple Transit X polo. He enthusiastically explained his vision, which far exceeds the confines of the molded carbon-fiber prototype. Each Transit X pod will weigh 75 pounds and stretch 44 inches wide. Pods will hang off a network of overhead rails supported by vertical poles. A commuter could simply step outside, walk a couple steps, and call their very own transit pod. Stanley says this could be done by mere eye contact, by using a kiosk, or by phone. He envisions a world where cars are obsolete, where blacktops and parking spaces are replaced with green spaces and parks. Instead, pods would zip at 45 miles per hour through neighborhoods on rails following the contours of what were once roads. Stanley, an MIT graduate, tells me he’s been building robots since he was 12 years old. He shows me a childhood photograph on his iPad of a young Stanley posing in front of science fair tri-fold boards featuring computer-controlled robots with voice interface. Transit X marks a natural continuation of Stanley’s lifelong engineering story. When Boston’s 2015 snowstorm created transit hurdles across the city, Stanley began thinking about why and how this happened. “Practically speaking, it was just trying to get my wife to work safely,” he says. Since 2015, Stanley has logged 500 proposals on his website for municipalities worldwide. He tells me he has another 450 in store, not yet posted. Each proposal comprises a 13-page PDF document with facts and figures including estimated single passenger fare and the number of pods needed to accommodate peak demand. He’s visited 15 countries with the hope of eventually spreading Transit X across the globe to countries including Rwanda, Ghana, Kuwait, Malaysia, Singapore, Philippines, China, and Guyana. So far, he’s received 14 “memorandums of understanding” from municipalities, which signify that a necessary number of government decision makers have agreed to work toward a formal process of making Transit X a reality. But Transit X has yet to break ground creating a network. Stanley explains that Transit X will be an entirely privately-funded venture, and that as he gathers construction partners, he is seeking investors who understand his vision. I ask him to describe what it’s been like to market Transit X abroad. His voice breaks as he recounts what people tell him about their transit troubles. “These are people's lives and they just can't, they have a really difficult time, you know?” he says, wiping away tears. In Stanley’s view, the possibilities of a pod-filled world are endless. He says the pod network infrastructure could carry public toilets, could be used “for water, for sewer, for trash, for recycling, for packages, for freights.” Tanker pods, car pods, ambulance pods, and home pods are just the beginning. “It's basically replacing the Internet, the Internet and everything's on the Internet and everything that's on the roads,” he says urgently. Stanley is convinced that a pod-based utopia is within reach. "This is the silver bullet. This is the silver bullet for not just transportation, but for happiness. This is the happiness pill."